than I, almost as long as I have, Dave, which is pretty spectacular. Dave McConnell, the star of WTOP, the number one reporter on the Hill. You’ve been there longer than anybody. Dave McConnell:	I probably have by now on the radio television side. I think there are a couple of print guys that have longer times in than me. Andy Ockershausen:	You have ingrained yourself so much into that Hill, and I have been a fan of yours since. Thank God you got that good WMAL training before you went out on the street and work with a lot of professionals. And all these years you work with a lot of pros. It helps you, David. Andy Ockershausen:	It keeps you on your toes. Andy Ockershausen:	I’m sure you remember it was our friend, Joe McCaffrey. Dave McConnell:	I do indeed. Andy Ockershausen:	He got into the newspaper business and we lost track of him. I don’t know. He died or whatever. He was down in Virginia somewhere. Dave McConnell:	When I first came to the Hill I used to see Joe, yeah. He was still there. Andy Ockershausen:	Yeah. Well, I think he got out of the army here and didn’t leave. WTOP, one of my favorite sounds. I remember when it was WJSV. I remember the lineup was Eddie Gallagher. Who was following them? The morning man was, oh God. Well Eddie did that moonlight show. What was it called? Dreams or something? Dave McConnell:	Yeah, that’s right. Mark Evans. Housewives protectively. Andy Ockershausen:	I was a CBS guy and I was at his funeral and had a chance to talk about him a little bit. Jim Gibbons, who had been working for us along with. But WTOP was such a powerhouse with that 1,500 signal and nobody could compete with that. Then FM came along. Then FM was made by WTOP-FM, by switching at FM station. They bought the station, right? Dave McConnell:	Our original FM station, we gave away to Howard University. Andy Ockershausen:	And Mrs. Graham? Dave McConnell:	Well, Katherine Graham, Larry Israel, was running the station then I’m thinking. Andy Ockershausen:	Yeah. I was talking about Larry, paying him a compliment because I got to know Larry quite well because it was a small town then, Dave. Ain’t that way anymore. Andy Ockershausen:	You knew everybody, everybody knew you. Management, talent, whatever. We were all together, you know the hangouts were the same; the Dancing Crab, or Duke’s Restaurant, or whatever it was. It doesn’t exist anymore, the camaraderie. But Larry Israel called me one day and said that they were broadcasting Maryland football, and he said, this is like 1968-70, said, “We’re going all news and I’m not gonna be able to do any more play-by-play because you can’t do both. You can’t be all news and do play-by-play.” It was his theory. Andy Ockershausen:	And I supported that because he’s right, you can’t have a baseball game on and say you’re doing all news. And he couldn’t have a football game. So, he tipped us and we called over there and made a deal to take the games off of WTOP. And that’s when people were close, I don’t think that exists in radio anymore. Lot of competitiveness, but work together. Andy Ockershausen:	You might not have felt it that much on the Hill. But you had people in your world, your news world, some very exceptional reporters that covered the Hill for the other stations. Particularly with TV and the guys from WRC, you know, someone became, Arthur Godfrey, people like that. WTOP was Arthur Godfrey for a while. Andy Ockershausen:	But, David, you have done so good. Have you ever had a chance to sit back and think how many reports you’ve done in your 55 years? Dave McConnell – Reporting for 55 Years, and Counting! Andy Ockershausen:	Haven’t you, you’ve covered the best and the worst. You weren’t there, you were too young to remember the shooting. When the House of Representative guys had pistols. Dave McConnell:	I remember listening to the radio reports about it then, in 1954. I do remember that very much. The bullets are still in the wall down there, in the House Chamber by the way. You know they never took them out? Andy Ockershausen:	Was that the same group that was trying to get into Blair House or was that a different group? Andy Ockershausen:	Puerto Rican nationalists. Dave McConnell:	Puerto Rican nationalists. Andy Ockershausen:	Now they got their independence and they want money. They don’t go together. Dave McConnell:	No, not really. Andy Ockershausen:	All the people you’ve known. I mean, the characters on the Hill. Any of them special that come to mind? Like Tip O’Neill? Dave McConnell:	Tip O’Neill was one of the all time great characters. Andy Ockershausen:	Yeah. Remember the little guy who worked for him? I can’t think of his name. Dave McConnell:	Chris Matthews? One of the, oh, I don’t know, Chris Matthews is the friend, the person that I know that Tip’s major. Andy Ockershausen:	Oh Chris, oh yeah. Married to my girl. The erstwhile Kathy Cunningham. Dave McConnell:	Yeah, okay. Kathy Matthews, yeah. Andy Ockershausen:	I believe him. Dave McConnell:	Me the man with the beautiful voice, I mean, you know. Andy Ockershausen:	Oh, yeah, he was typical New England politician. Dave McConnell:	He was a great. All politics was local and Tip O’Neill knew how to control politics both local and national. It would be interesting to see what kind of a challenge it would be for him to be on the Hill today, the way he did politics. But he kept the party together during some tough times and, you know, like everybody else he decided one day to retire. Became a little bit ill, he got a little sick. Andy Ockershausen:	Yeah, I knew that. Dave McConnell:	Had an issue there. Andy Ockershausen:	And Lyndon was president when you were up on the Hill then? You didn’t know him as a Senator, did you? Dave McConnell:	I did not. I did not cover the Hill in those days. Let me see, first time I went to the Hill was 1981. So that would have been when the Republicans took over the White House. Andy Ockershausen:	It was Ronald Reagan. Dave McConnell:	Yeah. When Reagan took over the White House. Dave McConnell:	And by the way, the Republicans took over the Senate for the first time in eons. Andy Ockershausen:	And that’s when he and Tip got close together, Reagan and Tip, right? Andy Ockershausen:	Couple of Irish Poles? Dave McConnell:	That’s exactly right. Andy Ockershausen:	How about this new group? Do you have any favorites? You can’t pick favorites. Dave McConnell:	I can’t pick favorites. But, you know, I think they all have something. I get this question a lot, I’ve gotten it a lot over the years. You obviously wanna say Ted Kennedy stood out among people. There were other people who stood out who came and went, and there’s no doubt about that. But my view is, they’re all interesting in their own way. You try to cover as many of them as you can. They have different strengths, different weaknesses, they’re big on different issues. You obviously follow Senator McConnell, Mitch McConnell, the majority leader. We have a little joke, he calls me cousin Dave, I call him cousin Mitch, because we have the same last name. He has a very dry sense of humor, he seems very formal in his presentation, but he’s a different person when you talk to him one on one. Andy Ockershausen:	Yeah. You can get along with him. Dave McConnell:	But he’s somebody that stands out. As did Senator Mitchell when he was the majority leader. Andy Ockershausen:	What happened to him? He went to baseball and did something major league. Dave McConnell:	Well, he retired. He felt he’d had enough of a career and he went on to do the baseball job, commissioned by baseball. And then he’s called in from time to time. He did the Good Friday brokering, when the North and South Ireland people finally got together. He was very shrewd, very good at that. Andy Ockershausen:	He was a great, great leader on the Hill. How about on the House side? Of course Tip. But others that are up there now on the House side? Ryan. There’s another Irishman from Killarney. Andy Ockershausen:	It is what it is with him. Dave McConnell:	Yeah. He’s trying to thread the needle with President Trump, who he really doesn’t agree with on a lot of issue, and probably is appalled by his behavior, but he won’t say it in public. Andy Ockershausen:	He’s the party guy. He’s gotta be as the leader. The majority leader. The Speaker of the House, why am I saying majority leader? But when Lyndon Johnson was on the Hill, he had the same control of the Senate as Tip had of the House. Lyndon controlled the Senate, but he and, who was it? Sam Rayburn? Dave McConnell:	Sam Rayburn was the old Speaker of the House. Andy Ockershausen:	The old politicians. They knew how to make deals, still. I don’t know that the new group does. This is Andy Ockershausen. This is Our Town. I’m talking with Dave McConnell, the dean of the Capitol Hill Reporter. Andy Ockershausen:	This is Our Town with Andy Ockershausen. Having a wonderful conversation with Dave McConnell. Who knows a lot of secrets he can’t tell us because he wants to keep his job. But if I had a session with doing editorials in the old broadcast days on WMAL, I’d be criticizing the members of the House and Senate. Getting that free parking at National Airport, right next to the gate almost. They had their own little lot there. And I felt that was unfair to the public that they should be parking where everybody else parks, you know? Or get somebody to drop them off. What they did was, with Joe McCaffrey, they took his parking place away. Dave McConnell:	That’s amazing. I did not know that. Dave McConnell:	Jim Wright. I knew Jim, yeah. Andy Ockershausen:	McCaffrey, he got it back. And we got it back, we had a good relationship with him. I used to go nuts with the parking. I grew up in Northeast, Washington. I know how beautiful those parks, but now they’ve concreted over most of the parks that I knew as a young grown-up, and they’re parking. The story I heard, Dave, now this may not be true, but he told me. Joe McCaffrey, when he got out of the army he went to work on the Hill, said there were 4,800 employees of the House and Senate working on Capitol Hill, 4,800. When he retired, there were over 40,000. Andy Ockershausen:	So has the Senate. Dave McConnell:	So has the Hill, yeah. And yet, there’s always somebody on the Hill that wants to cut government jobs. And we saw recent statistic, they’re still at about the same figure that they’ve been for many, many years. Andy Ockershausen:	About 40 or 50 years. Dave McConnell:	Yeah, at least. Andy Ockershausen:	Well, nobody wants to lose their job and they don’t wanna lose their patronage either, right? Andy Ockershausen:	Do they still have elevators on the Hill? Dave McConnell:	Oh yeah. Not elevator operators. Sometimes during votes. Yeah, that’s when the members control all the elevators, and we peons we reporters we’d have to take the stairs. There used to be one elevator for reporters and general public, but the current Republican gathering, shall we say, has decided that they’re gonna take over that elevator, when they need it. Not all the time, but when they need it. So that’s gone too. Dave McConnell:	They make us walk. Andy Ockershausen:	Make reporters walk. The elevators were jobs, and that was patronage. And I know a lot of people that got into politics and got into business by one of those elevators. They had funny little, cage-like and everything. I used to go up to the Hill for meetings. I was talking the other day to a man about my relationship with a broadcaster from Burlington, Vermont. We were having a problem getting appropriation for, not for visitors, for something big downtown. It was controlled by the head of the D.C. committee. The chairman was Daniel Leahy. Not Patrick. Dave McConnell:	From Vermont. Senator from Vermont. Andy Ockershausen:	With local people. Andy Ockershausen:	Those D.C. committees and the House committees for District of Columbia, we’re very strong. Andy Ockershausen:	Blatnik, remember that name? Dave McConnell:	I do. Congressman Blatnik from Wisconsin, yeah. Dave McConnell:	His son is still working on the hill, in some capacity. He had a son, and he worked in his office, then when Blatnik got a heart attack and died, they kept him on. Andy Ockershausen:	Is that right? Oh my, but that name was very in with the House district committee, or the Senate district committee and … I was trying to think of a guy, I played tennis with him at Army-Navy. I used to call him Mr. President. He kept sending … He’s a senator from Connecticut. He was gonna run for President. Dave McConnell:	What about Abe? Andy Ockershausen:	No, after Abe, a young guy, but he didn’t get to be President I wanna tell you that, but we had fun with it. The people on the Hill were part of the community, they lived here, ya know. Andy Ockershausen:	Like Richard Nixon used to live in Park Fairfax before I moved in. I found that out. Various people lived in the apartments up close to the Hill. It was a small town, still is. But it’s so hard to keep up now Dave. Dave McConnell:	From Chicago, they would get in a car and bundle up to Chicago on Thursday evening, comeback Monday morning. They’d spend the weekend in Chicago. Now, with a flight, I know a congressman from Texas, he catches his flight Monday morning, he’s here for the vote that evening, or he’ll catch Tuesday morning if there are votes that night. They usually don’t schedule votes much beyond Tuesday, Wednesday, or Thursday. So Thursday afternoon in the House, they’re out. They’re catching their planes back home. You don’t have people buying homes, it’s very expensive. The real estate’s gotten a lot more expensive. Andy Ockershausen:	Oh that it has. Dave McConnell:	It’s very hard to have a home in Washington, and so they’ve decided not to break up their families. Beyond that, a number of congressmen on the Republican side don’t even rent an apartment here. They use their offices for their living space. They go to the gym to wash up, shower and exercise, so they never leave their office. They hardly ever get into the town, and you don’t have that interaction between at least some members of Congress and Washington D.C.
Andy Ockershausen:	Yeah I’ve heard about them sleeping on the couches or whatever, or they bring in cots and so forth. You’re right about the real estate. Capitol Hill real estate has exploded of course. Andy Ockershausen:	I grew up close to the Lincoln Park area, I never considered that Capitol Hill, Capitol Hill is up by the Capitol. Now in Lincoln Park, the house are millions of dollars! It’s just a dumpy little park, but that’s the way it is in D.C. now. Dave McConnell:	It is, it is, it’s changed everything. Andy Ockershausen:	Now did you grow up in the city, Dave? Andy Ockershausen:	The street car used to go to Branchville! Dave McConnell:	It was the end of the street car, that’s right. It went from Branchville into Washington. To Eckington … this is really old time, but they take the old Tunerville Trolley’s out there and you get on a more modern one, and it’s where they had the connection below the street to make the car run instead of a little thing that hit the rails. Andy Ockershausen:	Oh I know, the plows. Andy Ockershausen:	You’ve been a part of that town for a long time obviously. Then you went to the school out there, DeMatha. Dave McConnell:	Went to DeMatha High School. Andy Ockershausen:	Grad school and so forth? Andy Ockershausen: DeMatha. It was very small then, wasn’t it? Dave McConnell:	It was, we only had two or three hundred students, and it was new. Dave McConnell:	I was all set to go to St. John’s Military Academy where many Catholic … Many Catholic boys went either to Saint John’s or Gonzaga. Dave McConnell:	And I didn’t want … I didn’t think the Jesuits were for me because they were too strict, and maybe I wasn’t smart enough for Gonzaga, frankly. But St. John’s was a pretty smart school, I loved the uniform, and I though maybe that’s … I thought maybe I’d go on to West Point. Then I heard about this school in Hyattsville, run by the Trinitarians called DeMatha, and they were gonna have a swimming pool in the building. Andy Ockershausen:	Wow! On campus huh? Dave McConnell:	And that did it. I told my parents, look, cancel the application to St. John’s, I’m going to DeMatha, and I did. We never got a swimming pool, but as far as I’m concerned I got the best education I ever had. Andy Ockershausen:	Wonderful times. Was Morgan Wootten there then, when you were in school? Dave McConnell:	He was just about there, not quite there. Andy Ockershausen:	He’s was a teacher too! Andy Ockershausen:	Not only a coach, but a teacher, which is what he did with basketball. He taught those kids how to play. Then he brought that to the classroom. Now DeMatha has sort of exploded. Andy Ockershausen:	We have friends that built a hamburger place called Elevation Hamburgers, Hyattsville, and you can see DeMatha has turned into a very profitable business. Dave McConnell:	They’ve taken over that whole block, yeah. Andy Ockershausen:	Absolutely, DeMatha’s school is so great now, and they recruit of course, and they do it and they have great kids, but they have great educators. Dave McConnell:	They do. They do. Andy Ockershausen:	Which is what a lot of kids go to Prep for. Andy Ockershausen:	And Gonzaga. I know a lot of kids that when I grew up, they went to Gonzaga, I went to Eastern with Larry Hogan. Andy Ockershausen:	The Congressman, he went to Gonzaga, he and his brothers. Andy Ockershausen:	And they were good kids, but I don’t know where the son went, I’m not sure he went there, but he’s had a spectacular career. He had never ran for anything and all of a sudden he’s Governor. Andy Ockershausen:	I didn’t know that could happen in Maryland. Dave McConnell:	Well, it’s in politics if you’re in the running … this is gonna sound so hackney, but it’s true, if you’re in the right place, at the right time, that’s all that matters. From what my friends who cover Maryland politics tell me, that’s what happened with Larry Hogan, the voters were looking for something, they were discontented with what they perceived, and I’m not going to say whether they were right or wrong. They perceived as something that wasn’t working, it wasn’t clicking. The Governor wasn’t … the party that was running the state, at least the Governorship, the Democratic people there, they weren’t connecting to a certain segment of the people. And so enough of those people voiced their concerns at the polls, and that’s how Larry got in. Andy Ockershausen:	Well he was like every man too, you know, he’s a blue collar guy without being a blue collar guy, but that’s what his perception was. Dave McConnell:	Well his father was the one Republican who could get elected in Prince George’s County as County Executive. Dave McConnell:	And he was the three terms congressman before that, and the Watergate years, all of the other Republicans, a lot of them got kicked out and he didn’t. Well actually he was running for Governor and I think he either had to give up his seat, or when he tried to keep it, it didn’t work. But he had three good terms. Andy Ockershausen:	And they threw out the guy, who was the guy in Maryland the two names, the three name thing … Senator. I think he was from Frederick, but he represented Montgomery County. I think he got bumped off at that Nixon massacre. He had two names or something. Janny, you gotta help me. He was … I’m talking to Janice, she’s in charge you understand. Dave McConnell:	Well, Montgomery County and Frederick, that area was represented for years by Congressman Mac Mathias. Andy Ockershausen:	Him. That’s it, Mac Mathias, that was his name, Mac Mathias. Dave McConnell:	Charles “Mac” Mathias, that’s right. Well, McCurdy, is his mother’s name. They were from Frederick, but then he moved into Montgomery County, he took it over from a Democrat back in 1980, and he held the seat for about eight years, and then he ran for the Senate defeated Danny Brewster, Senator Brewster, and he had his seat for three terms. Andy Ockershausen:	And then he just quit, didn’t he. Dave McConnell:	Then he decided it was time to retire, and he did. Andy Ockershausen:	There’s so many characters that you have to deal with from … I remember the guy in Virginia, Bill Scott, remember the Senator from Virginia? Dave McConnell:	I do yeah. Andy Ockershausen:	He, no, he did it in a press conference, you wanna hear this, the United States Senator stood up and said “These stories about me being the dumbest Senator in the Senate is not true. There are people here dumber than I am.” That was on the record. I heard the tape, I couldn’t believe it. Dave McConnell:	He was actually right. Andy Ockershausen:	That was Bill Scott. Well this is Dave McConnell, we’re having a great time David. I guess I was never a worker in the Hill, but I lived close to it, and because of my association to the broadcast business, I got real close to it, now when we come back I’m gonna ask you some more names. Andy Ockershausen:	This is Our Town with Andy Ockershausen. [Commercials] Charles Mann: Hi, I’m Charles Mann. For athletes like me playing every down in a pro game is like getting in a car accident. After years playing football in Washington, my body is broken, I’ve had countless surgeries and joint replacements. I’ve been looking for a non surgical treatment since I ended my career. I heard a radio ad for a seminar about alternative treatment, it’s called “regenerative medicine” which stimulates your own body to heal and repair itself. No surgery, no more pain. That got my attention. I went to the seminar to learn first hand all about it. Now you too can benefit and receive this treatment. This is the same procedure that pro athletes use to quickly and effectively recover from injury. If you are looking to eliminate your pain and arthritis or if you thought surgery was your only option, take the first step like I did, call 410-787-7250. Register for the next seminar and learn more about this breakthrough procedure. Seating is limited, register now by calling 410-787-7250 and start living life again! Tony Cibel: Hi,Tony Cibel here, to tell you about Tony and Joe’s and Nick’s Riverside Grill at Washington Harbour in Georgetown. Spectacular new restaurants. We’ve spent a lot of time rebuilding. You’ll love it, it’s really fantastic. For any information, you can go online to tonyandjoes.com. It’ll be a wonderful experience for the whole family. Call 202-944-4545 to make reservations. Everything is fabulous. You’ve gotta come down and have some wonderful food. Announcer:	You’re listening to Our Town, with Andy Ockershausen. Andy Ockershausen:	This is Andy Ockershausen and Our Town, I’m with Dave McConnell. Dave’s got so many great stories from the Hill, which I appreciate because growing up on near Lincoln Park, which was at the Hill, and being involved with the broadcast business, I know so much, and maybe some of it’s wrong, but Dave McConnell is such a big important part of Our Town. Dave McConnell:	Well I appreciate you saying that. Andy Ockershausen:	You have information, and no surprise, it’s tough for you to do it, but you have to write this into a book. Leave it for future generations. What you have gone through on the Hill. Dave McConnell:	Well, if I get enough time someday I probably will. Andy Ockershausen:	It’s been a great fifty years hasn’t it? Dave McConnell:	It has, it has indeed. Andy Ockershausen:	Now all the characters … you ever stay in touch with any of them? Most of them go home. Dave McConnell:	I see Jim Moran occasionally, Congressman Wolf, the local guys. I bump into them who have retired. Other people who’ve retired, they’re either in some … They’re off the Hill lobbying, or they go back home, and so I don’t see them. Andy Ockershausen:	Frank Wolf, Frank Wolf. Dave McConnell:	But he was a great guy. Andy Ockershausen:	Jim Moran, the boxer. Dave McConnell:	That’s right, that’s right. Andy Ockershausen:	We had a charity event, and we petitioned Moran … to have a one round boxing match with Marion Barry, and we put robes on them and gave them big gloves. It was so funny. Dave McConnell:	I couldn’t believe that. Andy Ockershausen:	They played it was a joke, ya know. Well you’ve had some characters down on the Hill, like Marion. I mean. Dave McConnell:	He would … it was an event when he came to the Hill. Especially when all of the scandals started surrounding him. I remember, and it’s probably in some podcast, in some videotape somewhere, there was a gaggle of reporters, and I’m one of them, with their microphones, following him as he walks down a hallway to go to a committee hearing, asking him about his latest scandal, and he says … He loved it, he’s just putting us off, giving us answers, but there’s this amoeba like thing going down a hallway with all these reporters and equipment and everything, walking down there, and he’s walking along with us. Andy Ockershausen:	He probably loved it. Dave McConnell:	He did, he did. Andy Ockershausen:	He knew how to play the press, I’ll tell you that now. How to play the writers and the broadcasters. The people on the Hill are such an important part of Our Town, and now they have … They’ve dug up underneath the ground. Growing up in Northeast, we used used the Capitol steps and all that stuff for sports or whatever it was, we never got run off. We used the …we didn’t do it, they were mostly little dark kids, used the fountain in front of Union Station as pool. As soon as the hot weather came, they were in that pool. Dave McConnell:	I knew that. Andy Ockershausen:	And had a great time on the Hill! Andy Ockershausen:	Now you get up there, they’ve got guns. Dave McConnell:	Well my father-in-law, who grew up in Washington, Norman Jack, who grew up in Southeast, and Southwest, he would get a skateboard, or the equivalent of a skateboard back in the twenties, and he would go up and down the back steps. You can’t do that now. When I first came there, I would park off the Hill. I didn’t quite have a parking place yet, and I would walk up to the hill. There was a door at the Rayburn building and a desk where a police officer should have been and he never was. I’d walk right by that, get right on the subway in the Rayburn building, go into the Capitol. And no one, well even in those days they had metal detectors to check your baggage and check your person. But nothing like now. I mean, now it’s, you drive into the Hill and your car is checked and you’re checked. You have to show your pass, you get out of your car, my parking lot is in Rayburn, parking spot is in Rayburn. I get out of Rayburn and I get on part of the escalator, and that takes me over to the subway, the Capitol subway. That takes me over to the actual Capitol itself. Then I have to get on an escalator, catch an elevator, to get to the WTOP booth. Andy Ockershausen:	They’re probably checking your credentials almost all the way. Dave McConnell:	Everywhere. I’ve said, you know he checked back here. Well, that’s okay, we can’t get- after 9/11 everything changed. Andy Ockershausen:	Oh it did, that’s so true. And the shooting of those two guys, too. Dave McConnell:	I covered that, yeah. Officer Chestnut. I can’t remember, I’m sorry, God bless him, I can’t remember the other man’s name. Andy Ockershausen:	I can’t either. Dave McConnell:	But there were two fine Capitol officers. Andy Ockershausen:	But I knew in my work involved with Heroes because they had Capitol Police as part of the protection that Heroes gives, and there’d been a lot of fatalities with some of those guys. Even if they’re out of town and they’re under Presidential Assignment, if the Secret Service, whoever it is, Heroes looks out for their family. Dave McConnell:	When Senator Leahy had Ricin, not Ricin, but when he had small pox. The small pox. It causes small pox. When he went through that attack in his office, he then had special operations in plain clothes officers from the Metropolitan, not the Metropolitan police force, but from Capitol Hill. They would go with him wherever he went, including the Holy Trinity Catholic Church, which is where I attend mass on Sundays. And Patrick Leahy was in there with these two Capitol Hill plain clothes officers for a long time. Andy Ockershausen:	Long, long time. Well, I had a good relationship with Terry Gainer. Remember when he was out there on the Hill? Dave McConnell:	Yeah, I knew him well. Andy Ockershausen:	Yeah, terrific guy. The Capitol police were not as big as they are now. Now they’re like armed guards because of the threat must be incredible. Andy Ockershausen:	So many nuts. Andy Ockershausen:	And some of them live here, you know some of the nuts here too, don’t you? Dave McConnell:	Some of the nuts aren’t on Capitol Hill, some of the nuts are coming to Capitol Hill. Andy Ockershausen:	Nobody ever stopped us. We were kids. We’ve been to the Senate for their bean soup, just walked in. That was years ago. Dave McConnell:	They still serve bean soup, by the way, in the Senate. Dave McConnell:	He was one of the all-time characters, I got to know him. He was very friendly and he was mentally okay until the very end. Andy Ockershausen:	He was over a hundred, wasn’t he? Dave McConnell:	I think he was around there, yeah. Andy Ockershausen:	Duke, remember his assistant? Dave McConnell:	Oh yeah, Duke. Andy Ockershausen:	Duke actually was a Senator. Dave McConnell:	Well, at that time, the large part of the Senator’s daily business was directed by Duke. You gotta get here, gotta go there, can’t talk here, you can’t do this, and you can’t look at the ladies, things like that. Even though he did. It would be incredible to think of a Strom Thurmond on the Hill today. Andy Ockershausen:	Couldn’t exist, you’re absolutely right. Dave McConnell:	He couldn’t. A, one. He probably couldn’t get elected. Andy Ockershausen:	He was a Southern gentlemen in his mind. Dave McConnell:	He was a Southern gentlemen and a lot of the Senators were and still are somewhat touchy feely. If you watch CSpan and you watch them on the floor, even today, you’ll still see them put their arms around each other. Not so much as before though because they’re thinking about that and they don’t want to be perceived as being too forward. So a lot of that has gone out. Andy Ockershausen:	Automatically, oh my God. Andy Ockershausen:	The short end of the stick. Dave McConnell:	They have gotten a raw deal in politics, in the Senate, in the House, for a long, long time and I’m glad to see things are changing. Andy Ockershausen:	They’ve gotten a raw deal in business for a long time. Dave McConnell:	Yeah, our society . . ..
Andy Ockershausen:	These two women run my life, this is not fair. I don’t mind one, but two of them do. It’s great. Augustine, he’s gotta problem. His wife runs him too. Dave McConnell:	You know, pardon me for interrupting, you were kibbitzing earlier about how we had to go around and cover stories. When I first got to the Hill, you had to go to a Senate hearing or House hearing, you plug into what we called a malt box. You’d plug your recorder in it. You’d hope you didn’t trip over everybody else’s cord, and you’d sit down at the table and you’d figure well if you’ve got somewhere else to go, I’ve got to stop it, I’ll take this out. I hope I got enough tape. And then you go back to the booth and file the tape back, laboriously. Now, every hearing room in the House and in the Senate is connected to your booth, whatever booth you are in the Hill. You just push a button and you record from the Hill. You still got a lot of choices to make, and the problem with that is you stay in your booth too much and you don’t get to talk to the Senators and see them. Andy Ockershausen:	You don’t see anything. Andy Ockershausen:	Now they look unpainted some of the hallways. Andy Ockershausen:	Who relieved that? The Speakers? Dave McConnell:	The Speaker of the House and the Majority leader and the President, the Senate majority leader. And the minority leader. The leadership does that. Senator Bird was ambushed once. Dave McConnell:	Senator Robert Bird. Harry, I don’t know about Harry. Harry was not too cozy with the press either. I think he was still there hanging out when I went there but then he left. Andy Ockershausen:	Yeah, he was probably getting ready to leave when you were getting there. Dave McConnell:	Yeah, he was. Andy Ockershausen:	He was an apple farmer, he used to say. Dave McConnell:	Yeah, that’s right, apple. Andy Ockershausen:	What do they call it? Massive resistance or something? Harry Bird? Dave McConnell:	Well, he was part of the Virginia contingent, the Southern Resistance Strategy, he was part of that. Andy Ockershausen:	That’s the way it was. Dave McConnell:	But the situation on the Hill where covering stories was is that Senator Bird was shotgun or ambushed by Sam Donaldson of ABC. He was leaving the Senate floor and he was trying to get out of the building and I think he just gotten outside and there was Sam with his crew. And he put his microphone in his face and asked him a very tough question. It was a legitimate question but Bird wasn’t ready for it. Senator Bird had these attitudes about the Senate that it must be treated, it was a special place. Andy Ockershausen:	Oh, yeah. He’s a traditionalist. Dave McConnell:	And it wasn’t a circus. And whenever some big story would come like the Clinton impeachment, he decided the Senate would not be the circus that the House was with these hearings and everything. It would be regular order, it would be dignified. And he hated anybody coming down the hall, and he got the rules fixed, or he made sure the rules stayed, that we could not get in the Capitol, could get near a Senator, except in certain places. That’s all changed now. Andy Ockershausen:	Sam Donaldson rule, huh? Dave McConnell:	The Sam Donaldson rule, yeah. Andy Ockershausen:	Sam was so obnoxious with his treatment of both parties. He was not favored of any of them. Dave McConnell:	No, he was aggressive but very good reporter. Andy Ockershausen:	Oh, yeah. Oh we know Sam quite well. He did some work with WMAL one time, but yeah. I didn’t think he was any good, I said “Sam, you’re terrible on television.” But that was personal. Andy Ockershausen:	Sam was over here, right? WTOP-TV. Dave McConnell:	TV. We were a TV and radio when I first started, we all did both. Andy Ockershausen:	That’s right. In the new building, too, right? Albermarle. Dave McConnell:	Broadcast, it was called Broadcast house. Andy Ockershausen:	Yeah, Broadcast. Broadcast. Dave McConnell:	He had an hour show on Sunday and he would find a way for the new guys that came in to get a spot, and it was very good. Andy Ockershausen:	We like Sam very much. I see him occasionally. There used to be a restaurant here called Duke Zieberts, gone. Andy Ockershausen:	There’s no more hangout like there used to be for journalists and people from all the broadcast companies on the Hill. But everything changed, I think for the better. Dave McConnell:	For the better. Andy Ockershausen:	But WTOP has done so well, David, because of you and what you’ve done here and the young reporters and guys like Neal. He’s still such a youth, you know that. Youth is served. Dave McConnell:	Neal is one of our great reporters. Dave McConnell:	He’s a wiz. He’s a wiz technically. Andy Ockershausen:	He gets the same voice remember Ken Beatrice. Dave McConnell:	Well, he has a good voice. Andy Ockershausen:	It was annoying, but they knew who it was. Dave McConnell:	One thing before we quit I wanna say now and it’s in line with everything that we’ve been saying how things change, how things grow, and there’s been an explosion of news on Capitol Hill. I’m happy to say there’s two of us now covering the Hill for WTOP, myself and Mitchell Miller. And Mitchell is a great reporter and it’s wonderful working with him and I’m glad to have him with me. I just wanted to get that in before we finish up. Andy Ockershausen:	What is it, is it Mitch Miller the guy who had the TV show? What was his name? Dave McConnell:	This is a different Mitchell. This is a different, it was Mitch Miller. Andy Ockershausen:	Mitch Miller, right? Dave McConnell:	This is Mitchell Miller. Andy Ockershausen:	Mitchell Miller. He didn’t have a band. Dave McConnell:	He gets the question all the time, ad nauseam, are you any relation to Mitchell Miller. No he’s not. He’s from Michigan. Andy Ockershausen:	He had his own TV show, it was an hour or something and he just sang. Dave McConnell:	Sing along with Mitch. Andy Ockershausen:	Sing along with Mitch, but no sing. But to sing along with David, David thank you so much. Andy Ockershausen:	You’ve been a bulwark of this radio station and I know that and the people know it, those of us in the business appreciate what you’ve done and what you continue to do. I hope you keep at it until they kick you out of there. Dave McConnell:	They probably will and I probably will. Andy Ockershausen:	No they won’t. You’ve got too many friends from DeMatha, they’re afraid of you. Andy Ockershausen:	But you got a wonderful family, you’ve had a wonderful life in Our Town, and I hope you keep doing it for years, and everybody loves Dave McConnell. I can tell you that from personal experience. Dave McConnell:	Well, that’s very kind of you and nice of you to say that. Andy Ockershausen:	We all love Mac McGarry too. Dave McConnell:	Yes, rest in peace. Andy Ockershausen:	And I kid Hillary, she ran him out of a job but that happens in our business, right? If somebody’s better than you, you’re out. Dave McConnell:	Well I think Mac retired, didn’t he? And Hillary took over? Andy Ockershausen:	Yeah, he was sick. But thank you so much, . Dave McConnell:	Well thank you Andy. Andy Ockershausen:	You’re a great member of Our Town David. Dave McConnell:	Well thank you, I appreciate that. Andy Ockershausen:	And Megan has been a wonderful friend of my wife. Dave McConnell:	My daughter, Megan. Andy Ockershausen:	We love Megan. 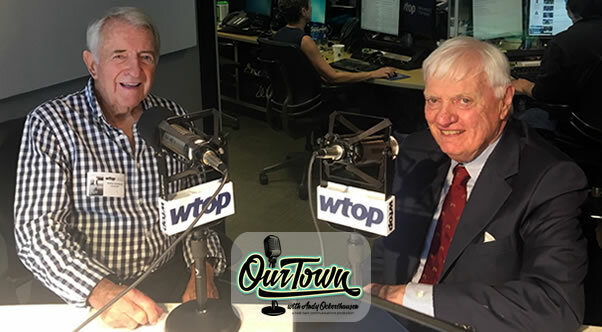 Andy Ockershausen:	This is Andy Ockershausen, this is Our Town, and we’ve had a wonderful conversation with David McConnell. Announcer:	You’ve been listening to Our Town, season four, presented by GEICO, our home town favorites. With your host, Andy Ockershausen. New Our Town episodes are released each Tuesday and Thursday. Drop us a line with your comments or suggestions, see us on Facebook or visit our website at ourtowndc.com. Our special thanks to Ken Hunter, our technical director and WMAL Radio in Washington, D.C. And thanks to GEICO, fifteen minutes can save you fifteen percent or more on car insurance.